This page aims to help Seagate hard disk drive users to fix problem about low disk space on C drive on Windows Server. Download IM-Magic Partition Resizer Server to extend C drive of Seagate hard disk when it runs on low disk space on Windows Server. Do you know Seagate hard drive? If your Seagate hard drive runs into the problem that C drive is running out of disk space, you can use the professional partition software IM-Magic Partition Resizer Server. 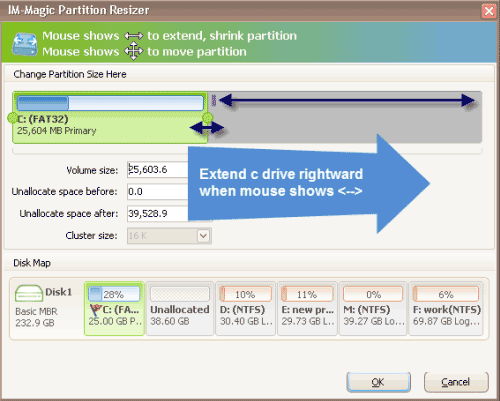 This partition software helps you resize Seagate hard drive without repartitioning the hard disk. With this partition software, you can resolve C drive low disk space problem easily without losing any data. This software can work on all Windows Server including Windows 2003, 2008, 2012, Windows SBS and Windows Server R2. Shrink the selected partition so as to create some unallocated space. You need to move the unallocated space close to C drive. Right click C drive and choose "Resize/Move" option. 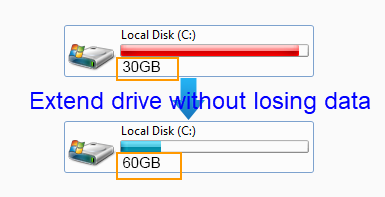 Move the arrows to add the unallocated space to C drive and then click "Apply" button. "My Seagate hard drive has been used for several years in my computer which runs Windows Server 2003 OS. Recently, Windows Server pops up a low disk space warning message on C drive (system partition). I am wondering if it is possible to resize the Seagate hard drive so that I can extend the C drive on Windows Server 2003. Does anybody have the similar experience?" "I receive a low disk space alert message on C drive when I start my PC today. My PC runs in Windows Server 2008 operating system, and the hard drive on my PC is Seagate hard drive. The C drive has FAT32 file system and it only has less than 1GB free space left. There is another partition on my PC, and it has about 40GB free space. So I want to look for a solution to move about 20GB free space from another partition to C drive." Seagate hard drive is used by lots of people. When you receive low disk space warning message on C drive of Seagate hard drive, the best solution is to increase the size o C drive. Since the total capacity of Seagate hard drive keeps unchanged, you can only move free space from another partition to expand C drive. You may backup all important data and repartition the hard drive to redistribute disk space. However, as a matter of fact, things can be much easier if you can use the partition software because it provides safe way to resize any brand of hard drive without touching any data stored on the original space. By using this software, you do not need to backup any data or repartition the hard drive. Windows Server 2003 runs out of disk space on C drive? C drive gets full on Windows Server 2008? Windows Server 2012 running on low disk space on C partition? Whatever, the IM-Magic Partition Resizer Server can work on all Windows Servers like Windows 2003, 2008, 2012 to help increase the size of C partition. You can get C drive expanded by moving free space from other partition that has enough free space. If you can rely on this partition software, you can resize C drive without reinstalling system. Both FAT32 and NTFS file system are supported by IM-Magic Partition Resizer Server. As you know, formatting can erase a partition. If all data stored on the partition is not important, you can format the partition to erase everything stored inside so that you can free up space and solve the low disk space problem. However, if it is C drive system partition runs out of disk space, you cannot simply format the drive because operating system is installed on it. Instead of erasing everything stored on the partition that is running on low disk space, you can merely delete the unnecessary files. This solution can help free up some space, but it cannot resolve the problem thoroughly.